Buamdong, Seoul, Saturday 14 September, 6pm. Seoul Museum in Buamdong (not to be confused with the Seoul Museum of Art in Jeongdong, or indeed the Seoul Museum of History next to the Gyeonghuigung) is conveniently situated on the main road which takes traffic from northern to Seoul to the Gwanghwamun area. Emerging from the museum, I hail a cab back to Insadong. I have some time before my next appointment and so I window-shop my way down the street, wondering whether I should buy myself some hanbok, but concluding that it will make me look like an idiot. Instead, as I usually do, I pop in to the Lee Geon Man store to browse the accessories. On previous visits I’ve bought a handbag, a scarf and a purse / wallet for my wife, and always a tie for myself. This time I was torn between several irresistible ties in colours that I have never seen in the London shops. Convincing myself that they filled yawning holes in my wardrobe, I settled on two of them. The long indecision had usefully consumed all the time available before I need to head off for dinner in Daehakro. At Hyewha Station I meet up with traditional dancer and ferocious drinker Yi Chul-jin, whom I met during his stay in London a few years ago. We are soon joined by our other companions for the evening: an author, Krys, and a newly hired university philosophy lecturer, Tim. Daehakro is Yi Chul-jin’s territory. It’s where he has a small theatre where he puts on traditional dance performances, sometimes mixing a contemporary dance item in with a programme of salpuri and pansori. He knows all the restaurants and drinking dens in the area, and I always leave the choice of food to him: wherever he chooses I always think is the best Korean restaurant I have been to – until the next time. He has chosen a popular samgyeopsal place in a side street, so popular that we have to queue outside, squatting on low plastic stools lined up against the wall. But we are soon inside, where the sweet smell of smoke and meat fat instantly assails us, and the energy of conversation among the other diners suggests we are in for a good evening. The restaurant does two types of pork – the normal raw belly slices and one which involves a three day period of fermentation which gives the meat a taste which my companions warned me would be “complex”. It looked as if it had been pre-cooked, but it tasted absolutely fantastic1. 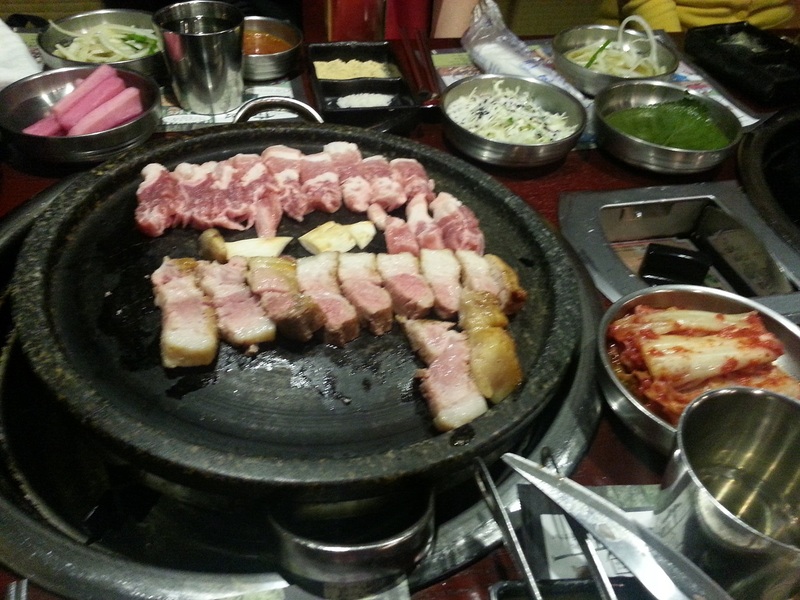 The table overflowed with side dishes, rice, jjigaes and raw meat waiting to be barbecued. There was hardly room for the glasses and bottles of soju and beer. I’ve been very sniffy about Korean beer in the past, but am now quite happy to tuck into a bottle of Cass as a thirst-quencher alongside the soju. I’m beginning to feel like I would be very happy drinking all night, but a new-found sensible part of my brain warns me that it’s not a good idea as I have to be reasonably on the ball the next day. As we leave the restaurant for icha, Krys makes her apologies, claiming she has a deadline to meet. Tim wavers for a bit before agreeing to another beer, and so it is the three men who head off in search of a suitable bar. Again, Yi has an excellent suggestion. In a dark basement room off a side street, was a virtually empty bar. But behind the counter the subdued lighting revealed substantial treasure: a wall crammed from floor to ceiling with LPs. The bar is called Blue Monday. We order our beers and continue our conversation. And then Yi gets out a pen and scrap of paper. 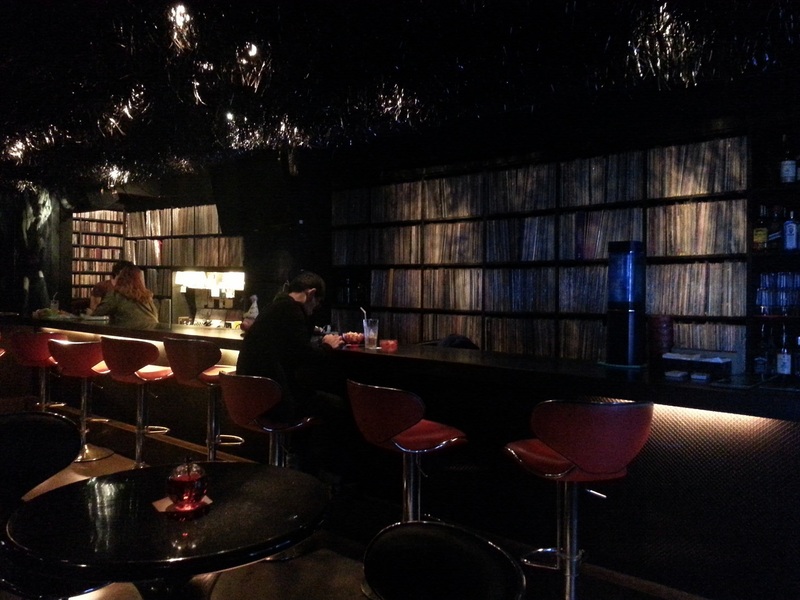 He starts listing out a couple of 1980s Korean bands, explaining that he’ll hand the list in at the bar to request some tracks to be played. Not wanting to be left out, Tim and I add our own choices. Wanting to test out the range of the collection, I included the 1970s British glam rock band Slade on the list. I was surprised when, 15 minutes later, the familiar raucous voice of Noddy Holder exploded from the speakers, from an album I had not come across before. Spurred onwards by our initial success, we tried ever more obscure bands, and as far as I recall we were never disappointed. All the records played were in immaculate condition, and the quality of the reproduction was audiophile quality, the bass in John Martyn’s Solid Air having the space and resonance that you might expect from a live performance. The supply of LPs seemed to be limitless, and it seemed rude not to buy another round or two of beers as we listened. But we’re not drinking enough for Yi, and I get the impression that he is disappointed that I didn’t have the stamina for samcha, but I have a 10am start the next day for the Sajik Daeje. In recompense, he insists that we meet the following evening for more drinks. I make vague noises that I might be free sometime after 7:30 the following evening, as I get into a taxi for Insadong.